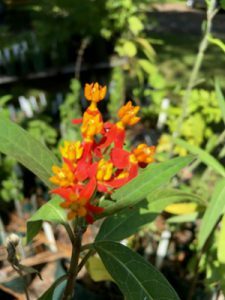 Hummingbirds and butterflies are drawn to the red tubular flowers of coral beans, which grow on tall stalks in the spring. In the fall, coral bean’s seedpods begin to mature and another show begins. 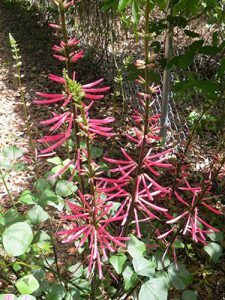 In our area coral bean is a perennial, reaching 6 feet tall before it freezes to the ground in winter. Coral bean is excellent for a natural landscape, It is very salt-tolerant and a good choice for coastal landscapes. Although they are very pretty, they are also very poisonous, be sure to keep them away from kids and pets. 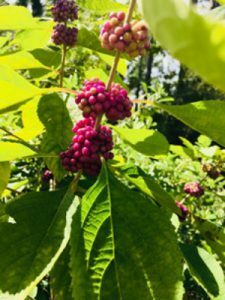 Beautyberry is a slightly sprawling, small, native shrub (3 to 8 feet tall; 4 to 8 feet wide) and can work well in most borders. It does well if planted in full sun and light shade. This plant is best known for its clusters of small, bright purple berries that appear in late August and September. If not devoured first by birds, the berries will persist for several weeks after the plant drops its leave. Milkweed is an important nectar source for bees and other insects, and serves as a host plant for butterflies. In fact, milkweed is the only plant material monarch caterpillars can eat. There are 24 Milkweed varieties in Florida. The native perennial available for the plant sale has red-orange and yellow flowers (pictured) that appear in late summer and early fall. Milkweed gets its name from the milky sap it exudes; this sap can irritate skin and is toxic if consumed in large quantities. As with Coral Bean, keep pets and small children at a distance. Beach sunflower is a butterfly-attracting Florida native that’s perfect for hot, dry sites, including coastal areas. Birds love the seeds! In North Florida, the plant is considered a tender annual plant that will die back after a frost, and re-emerge in the spring as it generally re-seeds itself. Many gardeners like to use this native plant as a colorful and drought-resistant ground cover as they grow 2 to 4 feet in height. 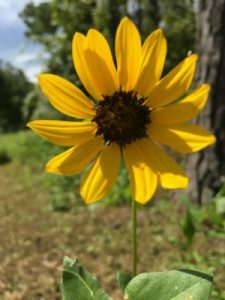 The plants bloom most of the summer, up to frost, with two-inch, daisy- or sunflower-like flowers that have yellow petals and brown centers. Because of their long flowering time, these plants can be especially good for brightening up the landscape during the hot summer and fall. They make lovely cut flowers! Fun fact: the flower heads always follow the sun throughout the day. Salvias are great plants for bringing butterflies and hummingbirds to your garden and as a bonus, they have no serious pests. 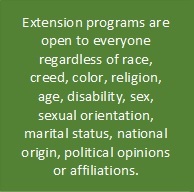 With hundreds of annual and perennial species coming in an array of colors and sizes. We will have red, lavender and blue at the plant sale. While different species of salvia will vary in terms of their height and spread, these plants will generally reach heights between 2–4 feet and can have a spread of anywhere from a foot to four feet. Their fast growth will quickly provide you with some color and greenery in your garden. Salvia often self-propagates, so you might find seedlings you can use in other parts of your landscape. Salvias are at home in mass plantings, borders, and even containers. The colorful, slender, tubular blooms of these plants make great cut flowers and will last for several days in a vase indoors. Be sure to come and join us at the Wakulla County Extension Office for the fall plant sale, September 22 and pick out a few plants for yourself or someone you know. Have a happy holiday season and a happy new year.